We bring awareness to the cruelty and criminality of Hoaxer activity and, if necessary, criminally and civilly prosecute those who wittingly and publicly defame, harass, and emotionally abuse the victims of high profile tragedies and/or their family members. We intend to hold such abusers personally accountable for their actions, in whatever capacity the law allows. In the aftermath of such horrific tragedies as the mass shootings at Sandy Hook Elementary School, the Aurora Theatre, Santa Barbara, and even the Boston Bombing, an offensive element of society, known as ‘truthers’ have seized the opportunity to advance their conspiracy theorist mindset upon the masses by posting a litany of various forms of speculation and disinformation on YouTube and social media sites. We refer to these individuals as ‘hoaxers’, because the core of their belief is that these violent tragedies were simply Hoaxes, perpetrated by the government in order to more easily limit civil liberties, especially those involving the second amendment. Rather than focusing their delusional grievances and accusations on authorities, the ‘hoaxers’ take the path of least resistance, harassing and emotionally abusing the victims’ family members online, on the telephone, and even in person. This practice allows them to feel as though they are doing something productive to have their voices heard, while staying safely away from the clutches of the authorities. This is a cowardly approach to having their grievances heard, and we need to ensure that they find some other method of doing so which doesn’t directly affect victims’ family members, or anyone else involved in the management of the tragedies, such as emergency service workers or those who were in any way involved. Even these individuals have found themselves the target of hoaxer hostility and harassment. And with those words crisis actor and criminal hoaxer Lenny Pozner hopes to stir up animosity and hatred toward anyone who dares question the now fully blown wide open Sandy Hook hoax event packed with Hollywood crisis actors playing multiple roles, blatant lies, bizarre inconsistencies, inexplicable secrecy, medical impossibilities, protocol violations and much much more. In response to this attack on Truth an activist hired me to build a website that would fight back against the blatant lies surrounding Sandy Hook. The goal was to vindicate those fighting for Sandy Hook Truth, restore some true honor to the search for Sandy Hook truth and help to spread the truth about Sandy Hook to the general public. So while Pozner refers to his site (Honr.com) as the “Honr Network” the new Sandy Hook truth site (Honr.info) is referred to as the “Honor Truth Network” and hopefully will serve as a reminder that those who stand for Truth need not ever be afraid or take a back seat to criminals and traitors who lie and play along with staged crisis actor false flag shootings which stage shootings for political purposes. 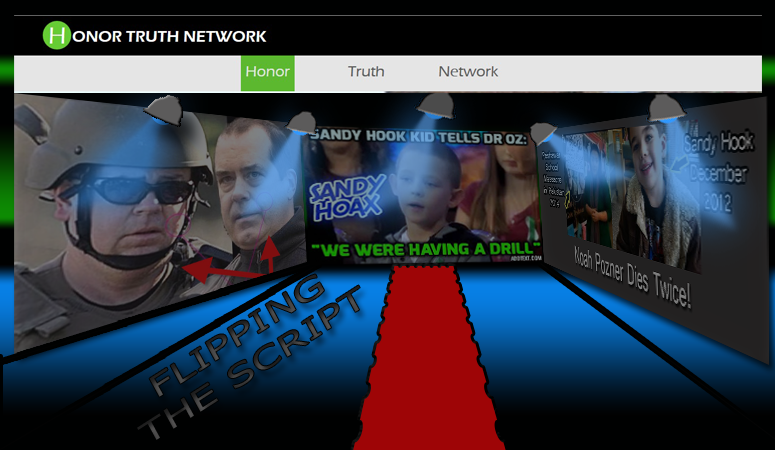 The new “Honor Truth Network” website is a landing page parody website that brings together a collection of hard work done by others to expose Sandy Hook and delivers it to the viewer in one simple page. It's the perfect website link to send to your friends and family without having to say a word. Simply tell them to go to the site and the links and images speak loudly for themselves. The Powers-That-Shouldn't-Be are moving full force to enslave this planet, poison its people, and wage continuous war for profit. They are blatant about their murderous agendas and outright theft of the people, and they have lost their healthy fear of us because, quite frankly, we are not doing enough to stop them. In a nutshell, we are letting them get away with murder. Literally. Sandy Hook was a massively transparent lie, saturated with mistakes and foul-ups. This reminds us that we are dealing with mere humans, albeit immoral, spiritually bereft, psychopathic ones. Their mistakes are evident in every one of their psyops, from the "LIVE" Virginia Reporter Shooting, the Umpqua Community College Shooting, the Boston Bombing, to the Sandy Hook FEMA drill promulgated as a real event by the mainstream media Mockingbirds. Make no mistake about it: Sandy Hook and all of these fraud shootings and bombings are devised as ammunition for the Central Bank Government to crack down on the 2nd Amendment and your right to bear arms, which our forefathers guaranteed with the Constitution FOR the United States. They are terrified of an uprising which is late in coming, and are actively disarming us so that we will not have weapons to defend ourselves against them. This alludes to the very bleak agenda they have in store for us, and which they are taking steps to accomplish every second of every day. The criminals involved in the Sandy Hook fraud are numerous and include DHS, CIA, FBI, the United States Government and it's propaganda arm known as Mainstream Media, Connecticut Mayor Dannel Malloy and the Connecticut state's Law Enforcement, and the Crisis Actors themselves--parents feigning loss over children that did not die at Sandy Hook while raking in millions in donations. These people are nothing more than psychological terrorists, and their crimes are punishable by law, if only there was law in this land that served the people, instead of protecting the criminals. The late Michael Ruppert said, "Pick up your weapon and fire it." Honr.info is one of my many weapons, with numerous links to resources at the bottom of the site which I consider to be some of the most conclusive evidence to prove beyond a shadow of a doubt that no children died at Sandy Hook. I encourage you to pick up this weapon and fire it as often as possible. And today we are picking up our informational weapons and firing it at the general public and the truth seeking community and reminding all to stand for truth regardless of the circumstances. I willingly volunteered to help get this website up because I realize that without fighting back there is nothing left. The Sandy Hook crisis actor bullies need to be exposed for who they are and humanity needs Sandy Hook to eventually blow over and be resolved if necessary in a court of law. We need to support individuals like Wolfgang Halbig and professor James Tracy who have risked it all to stand for Sandy Hook truth. So I ask truth seekers in the truth community to stop ignoring Sandy Hook thinking its going to go away. As I indicated recently, the crisis actors are not done yet with their criminal harassment of truth and neither should we. Remember that it is NOT harassment to demand truth about an event that makes absolutely no sense at all on many levels. Few events define the artificial 2-dimensional reality that the masses are currently hypnotized in and it is up to those who are informed and aware of the truth to share this information. Please note that this new website does not ask for money, it only asks for your attention. Will you give it the attention that it is due?